Noob Reviews: A new smoker’s guide to the best beginner smokes. This classic noob smoke is a change of direction this week, as it has a heavier body relative to the previous sticks. Widely known as an industry standard with Cuban roots, the 1875 Bully resides within many a cigar smoker’s humidor, worldwide. It features an Indonesian “tabaco bawah naungan” wrapper, which is just a tongue-twisting way of saying shade-grown. Beneath that lies a Dominican binder and filler. The Bully is a 5 inch stick with a 50 ring gauge. Feeling this cigar, you’ll find that it’s definitely one of the most solidly constructed cigars you’re likely to encounter. The wrapper’s subtle roadmap of veins is masked by a luscious, satin chocolate-brown. The iconic band still touts the gold medals Romeo y Julieta received when first gaining steam in the late 1800s. After punching the double cap, the cold draw surprised me with an upfront chocolate-strawberry flavor, accompanied by a bit of plum and tobacco. I had to pull a little harder than usual, as there was a fair amount of tension within this little guy. It’s built like a tank, making the name “Bully” fitting indeed. 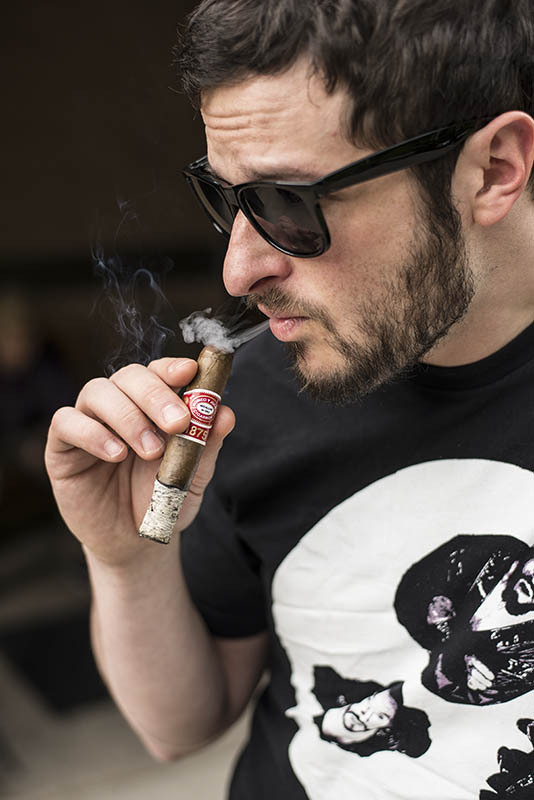 When I lit this cigar and took my first few puffs, I was blown away by the variety of flavor. In rapid-fire succession I was bombarded with pepper, nuts, wood, nutmeg, baking spices, earth, and cocoa, all within 3 or 4 draws. Swimming through this array I wondered what it was going to settle into, if at all. Quickly it withdrew from the fiery of flavor and decided to showcase baking spices and a thick, oak flavor as the main profile. The mouthfeel of this cigar is notably dry, leaving a feeling on the palate not unlike that of a dry wine. As the cigar progressed, a dark cherry flavor rose up, providing the oak base with a new dimension. The ash was slightly flaky and gray with a yellow tint; it was as resilient as they come. Passing notes included mint and a little cream on the finish. The cigar maintained a medium body all through. In the home stretch, the cigar started to mellow out significantly. Up until this point, the combination of the dry, medium body and the heavy oak flavor was a bit too heavy for my taste. As this receded, warm baking cocoa crept in, mellowing the feel of this cigar even more-so. This stogie should be a welcome stick on any smokers path. After you’ve smoked some of the more mellow stuff and are ready to take on something with a little more kick, this medium bodied cigar will fit the bill. It seems like Romeo y Julieta were aiming to make a stick that had a medium body, mellow flavor, flawless burn, and construction engineered by the gods. I say bulls-eye.